3G iPhone: Same but Different? Ted Rogers, President and Chief Executive Officer of Rogers Communications Inc. issued the following statement: "We're thrilled to announce that we have a deal with Apple to bring the iPhone to Canada later this year. We can't tell you any more about it right now, but stay tuned." Through Cable and Telecom we are one of Canada's largest providers of cable television, cable telephony and high-speed Internet access, and are also a full-service, facilities-based telecommunications alternative to the traditional telephone companies. Through Media, we are engaged in radio and television broadcasting, televised shopping, magazines and trade publications, and sports entertainment. We are publicly traded on the Toronto Stock Exchange (TSX: RCI.A and RCI.B), and on the New York Stock Exchange (NYSE: RCI). CTV News is reporting that Canadian communications heavyweight Rogers Communications has announced that it has brokered a deal with Apple to sell the iPhone in Canada later this year. "It can't come too soon for a sizable cohort of Canucks who have been looking enviously across the border and pining for the iPhone experience, although a few have jumped the gun and are using unlicensed 'unlocked' iPhones that can work with Canadian mobile providers. "The question now is, 'when?'" "But morning-after analysis by American Technology Research's Shaw Wu found several points of concern going forward, one of which was new to us. "Our sources indicate that the success of iPhone with its Safari web browser is putting strain on AT&T's (T) EDGE network in areas with higher user density." The iPhone is now even more accessible for Americans who are deaf or have a hearing or speech disability. Today, AT&T Inc. announced a new Text Accessibility Plan (TAP) for iPhone, designed to give iPhone customers with disabilities the choice of unlimited text messaging, Web browsing and easy access to e-mail for $40 a month. "Our Text Accessibility Plan allows customers who are deaf or have hearing or speech disabilities to literally tap out their communications on the go," said Carlton Hill, vice president of Product Management, Voice Products and Affiliate Marketing for AT&T's wireless unit. "Now with TAP for iPhone, users can tap, flick and pinch the innovative Multi-Touch touch screen for a completely new world of functionality." This new plan is available to new and current iPhone users with qualifying disabilities through AT&T's National Center for Customers with Disabilities (NCCD). To qualify for the iPhone TAP, customers must complete an application for eligibility. The form is available for download at http://www.wireless.att.com/about/disability-resources/text-accessibility-plan-for-iphone.jsp. During the iPhone activation process, customers sign up for a standard iPhone voice and data plan. After the iPhone is activated, customers can e-mail, fax or mail the eligibility form back to the NCCD to change their rate plan to the TAP for iPhone. Current iPhone customers who qualify may also submit the NCCD application to request the TAP for iPhone. Customers can contact the AT&T NCCD with questions at 866-241-6568 for voice calls or 866-241-6567 for TTY calls. AT&T offers TAP plans to qualifying customers for use with most handsets across AT&T's portfolio. The NCCD also helps AT&T customers with disabilities with a variety of applications that aid in wireless communications. These include Mobile Magnifier, which enables individuals who have low vision or are blind to zoom in on the screen and Mobile Speak, which reads aloud menu options. "Apple chief executive Steve Jobs will take the wraps off the much-hyped 3G iPhone during his keynote speech at the Worldwide Developers Conference on 9 June, according to Citi analysts. "The Apple conference, scheduled to take place in San Francisco June from 9 to 13 June, will witness the 'first of an impressive wave of new products', said Citi analysts Richard Gardner and Yeechang Lee." "The next generation of Apple's phone should include a significantly smaller phone that may replace the existing model, according to claims by Taiwan Economic News. The paper echoes recent rumors in claiming that the device will use a plastic backing in place of aluminum but also contends that the device will be significantly smaller than the original, with a 2.8-inch screen replacing the 3.5-inch model used today. The combination of a lighter material and smaller frame is said to reduce the weight to between 3.9 and 4.2 ounces from the initial model's 4.8." "AT&T is planning to put some extra shine on the even sleeker new Apple iPhone. "When the 3G iPhone is introduced this summer, AT&T, the exclusive US iPhone sales partner with Apple, will cut the price by as much as $200, according to a person familiar with the strategy." "Foxconn Electronics (Hon Hai Precision Industry) has reportedly landed orders for the assembly of second-generation iPhones from Apple supporting 3G, with shipments to begin in June this year, the Chinese-language Commercial Times has quoted sources at foreign institutional investors in Taipei as indicating. "The Commercial Times also cited sources at component suppliers as saying they have been instructed by Apple to begin preparing material supplies by the end of May." "Are the inclusion of GPS, a 3G chipset, a black plastic back that still won't let you replace the battery and a normal (not recessed) headset socket the only differences in the upcoming 3G iPhone? Or does Steve Jobs still have some iSurprises up his iSleeve? "A report from Engadget's Ryan Block has the details of what a 'super secret trusted source' has leaked about the next gen 3G iPhone." Link: 2nd-gen, 3G iPhone: Same Same, but Different? "Gartner expects Apple to stick with the x86 architecture for its mainstream notebook and desktop products in the near future. It is possible that Apple will move its iPhone to Intel's Atom processor first, and then move it to an Apple processor with a PowerPC core." PR: Developer kit for iPhone. The iPhone Developer Program provides a complete and integrated process for developing, debugging, and distributing your free, commercial, or in-house applications for iPhone and iPod touch. Complete with development resources, real-world testing on iPhone, and distribution on the App Store, you have everything you need to go from code to customer. The iPhone SDK includes the Xcode IDE, Instruments, iPhone simulator, frameworks and samples, compilers, Shark analysis tool, and more. Adds OpenGL ES support to the iPhone Simulator. You can now quickly build and test your mobile. PR: Maintaining the fight against breast cancer, Belkin International, Inc., introduces new designs of its pink-ribbon cases for the iPod nano. 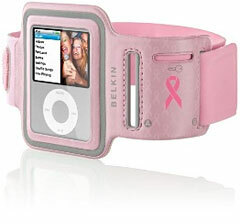 For each Sport Armband, Leather Sleeve, Slim Fit, and Remix Metal for iPod nano case sold, Belkin will donate $2.50 to support Susan G. Komen for the Cure (with a minimum guaranteed donation of $225,000). Belkin has donated nearly $200,000 toward breast cancer research to Susan G. Komen for the Cure. Susan G. Komen for the Cure's promise is to save lives and end breast cancer forever by empowering people, ensuring quality care for all, and energizing science to find the cures. 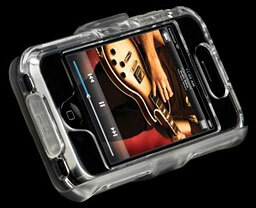 PR: Take an award winning Contour case then apply a luxurious rubberized finish to the outside. Snap securely together and what do you get - the protection and structure of a hardshell case seamlessly blended with the style and feel of a supple skin. Introducing the Contour HardSkin, a light weight, polycarbonate shell with the soft touch of silicone. 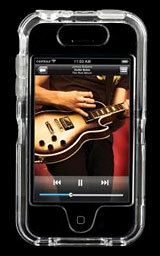 Based off of the iSee iPhone v3, the Contour HardSkin retains all of the protective qualities of its underlying chassis. From the durable hardshell to the click through buttons covering the volume and power switches, the HardSkin iPhone v3 offers total protection while still allowing full access to all of the controls. Add to all that the rich texture of its rubber finish and you will know, without a doubt, when you are holding a Contour HardSkin. "And if you ever get tired of carrying it," say Mike Jackle, Director, Product Development, "just pop the HardSkin in the included belt clip hip holster and rest easy." The Contour HardSkin iPhone v3 is available now. MSRP is $34.95 US. The HardSkin iPhone v3 is part of the Contour Cases collection created by Contour Design Inc., based in Windham, New Hampshire. 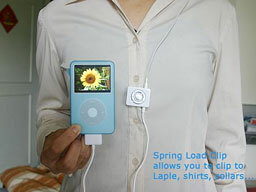 PR: The USB Fever iPod/iPhone 2-in-1 Remote + FM Radio adds FM radio reception to your iPod's capabilities. Support Manual tuning and Auto fine-tuning. In iPod touch/iPhone, the running frequency is not able to be displayed on screen (just a screen on iPod touch/iPhone shows to you that an accessory is plugged in) and therefore, you may not able to use the preset (memorized) frequency in this device and see the running frequency, however, it absolutely still a remote and tuner/radio for iPod touch/iPhone. 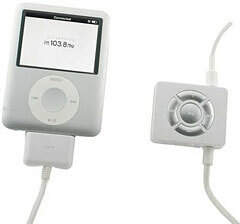 In iPod nano 3rd, the frequency may be a little bit delay to be displayed in the Screen, but the remote and radio/tuner functions are absolutely no problems. PR: RingtoneFeeder is a new and innovative approach to ringtones offering a subscription model which automatically installs a new original ringtone on the iPhone via iTunes every week. The earlier a subscription to the service is made the bigger collection the subscriber will have. When a ringtone has been released it will not appear in the weekly updates ever again. Once the ringtone has been synched via iTunes it is instantly available on the iPhone. The subscriber can keep all ringtones received permanently during the active subscription period even if the service is canceled later on. Using Smart Playlists in iTunes the user can manage the number of simultaneous ringtones to be synched to the iPhone automatically, however, the basic concept is simply to get a fresh new ringtone every week - just like getting an episode of a favorite podcast or TV show. RingtoneFeeder is currently offering two different subscription options. The monthly subscription cost is $1.98 or you can opt for a full year at $19.98 which both includes instant access to the 5 most recently produced ringtones along with at least one new ringtone usually released every Tuesday and a video tutorial about using RingtoneFeeder services, managing ringtones via Start Playlists in iTunes and synching with the iPhone.